A - Nina Paley's magnificent Sita Sings the Blues is an endlessly appealing treasure that weds animation's myriad visual possibilities to a witty, painfully personal howl of frustration and liberation. Recalling Yellow Submarine in its delirious blending of storytelling, music, and design, Sita proudly admits to its own conceptual simplicity. It presents a familiar story—one of the oldest, really—of love weakened by crisis and shattered on the shoals of mistrust and betrayal. But, oh how it tells that story! : With wondrous Flash-style animation whose captivating design can only be described as "Game Boy Bollywood." With pop art-inspired compositions and low-key chuckles that echo the Children Television's Workshop in its finest moments. With whorls and bursts of pure color. With ingeniously re-imagined jazz ditties that elicit sighs of delight. Paley offers that rarest of animated works: one that thrives on its own dazzle. Sita's unexpected luster extends to every crevice of its intricate yet natty form. Its joys emerge from the accumulation of a multitude of stylistic embellishments united by the vision of a passionate and furiously inventive auteur. Sita boasts two narratives and at least four animation styles, although the narratives consciously reflect one another, and the styles blend together and intrude at their edges. The film's rotten-apple heart is Paley's autobiographical tale of her marriage's traumatic disintegration, told in a self-effacing Squigglevision style. While Paley's pain and loneliness shine through in these personal episodes—and also in a rotoscoped interlude that blooms with rainbow-hued fire—the film devotes the bulk of its attention to the story of Sita, wife of King Rama in the Hindu epic the Ramayana. In this manner, Paley admits to the universality of her crisis, transplanting us from its anguished, scrawled particulars to a wider, timeless world of feminine tribulations. Paley discovers comfort within the Ramayana, but Sita Sings the Blues functions as a work more aggressive and joyous than the mere acknowledgment of connection between past and present. The act of making the film was manifestly cathartic for Paley, not just as a means to examine her husband's sins and her own missteps, but also as a celebration of her own aesthetic values. In other words, Sita is a giddy act of creation that has clearly emboldened Paley's post-breakup sense of identity. In an intimate gesture, the director warmly invites us to groove on her playlist, seeking validation not only for the Ramayana as a meaningful text, but also for the hipness of her own style. It's intrinsically personal film-making, with all the limitations that entails, but it nonetheless offers curiously infectious charms and sensory thrills beyond anything in recent memory. This isn't to say that Sita wholly neglects the cerebral for the visceral. The film indulges three separate approaches to the Ramayana, evincing a dog-eared and sophisticated understanding of storytelling's possibilities and pitfalls. Paley first offers a trio of Indonesian shadow puppets who provide a witty narration and commentary on the Ramayana. They stumble over half-remembered details, giggle at the story's implausibilities, and hold forth on their discomfort with its more problematic themes. Second, the film presents animated Rajput paintings that illustrate the major events of the epic, complete with voice acting that freely indulges in anachronisms. Third—and most stimulating—are the film's distinctive musical sequences, which combine vector animation with songs from jazz singer Annette Hanshaw, lip-synced by a wide-eyed and rolling-hipped Sita. These scenes represent a breathtaking formal achievement, a step beyond the recent "jukebox musical" phenomenon. Consider that Paley had to reconcile a rough outline of the Ramayana on one hand and Hanshaw's library of songs on the other. That she pulled it off at all is fairly impressive, but that she discovers a way to stage, say, "Who's That Knocking at My Door" during Rama's gruesome battle against the demon Ravana—well, that's nothing short of marvelous. The stylistic delineation of Sita's sequences serves to break up the epic into digestible morsels, and also to orient the viewer in light of the frequent—yet cyclical—shifts in tone. (In this, Sita echoes, to a lesser degree, the elegant coding of Mishima's narrative streams via color and design.) For all of Sita's undeniable first-order appeal—and it is most essentially a lusciously, toe-tappingly good time—what emerges from its whimsical fiddling is a gentle feminist critique of the Ramayana and the contemporary social and interpersonal sicknesses that mirror it. In perhaps the film's most unexpected and naughty moment, the characters that previously inhabited the candy-colored realm of Hanshaw's tunes suddenly burst into an original, up-tempo chant about Rama's supposed virtues, remarking (with a dash of mockery): "Duty first, Sita last." That line gives voice to the rumblings in the film's belly, a gnawing sense of injustice born from the fact that Sita's (read: Paley's and women's) devotion and sacrifices are so routinely rewarded with mistreatment. Still, while Paley permits heartbreak and self-loathing to intrude on Sita's autobiographical sequences, the film doesn't have much time for rage. Ultimately, a mood of liberation and enlightenment triumphs as Sita washes her hands of her husband—and her old life—with a song. 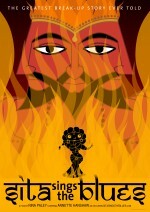 Sita Sings the Blues is unlikely to show up in a theater near you. Asinine copyright restrictions on the Hanshaw recordings have created an enormous barrier to distribution, and so the film's appearances have been limited to film festivals and other isolated screenings. Yet word-of-mouth praise has been mounting for this astonishing film. There may still be hope for a distributor yet. At the very least, allow me to add one more nugget of praise for Sita, raising anticipation for a future DVD release and Paley's next animated wonderwork.